Little, Brown and Company, 9780316265409, 336pp. Recent research suggests there are only six basic emotions. 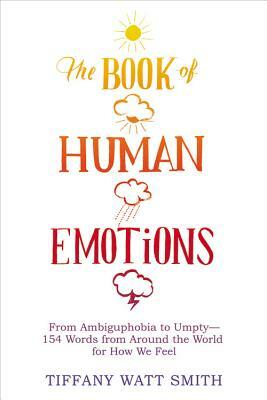 But if that makes you feel uneasy, suspicious, and maybe even a little bereft, THE BOOK OF HUMAN EMOTIONS is for you. In this unique book, you'll get to travel across the world and through time, learning how different cultures have articulated the human experience and picking up some fascinating new knowledge about yourself along the way. From the familiar (anger) to the foreign (zal), each entertaining and informative alphabetical entry reveals the surprising connections and fascinating facts behind our emotional lives. Whether you're in search of the perfect word to sum up that cozy feeling you get from being inside on a cold winter's night, surrounded by friends and good food (what the Dutch call gezelligheid), or wondering how nostalgia evolved from a fatal illness to enjoyable self-indulgence, Tiffany Watt Smith draws on history, anthropology, science, art, literature, music, and popular culture to find the answers. In reading THE BOOK OF HUMAN EMOTIONS, you'll discover feelings you never knew you had (like basorexia, the sudden urge to kiss someone) and gain unexpected insights into why you feel the way you do. Besides, aren't you curious what nginyiwarrarringu means? Dr. Tiffany Watt Smith is a research fellow at the QMUL Centre for the History of the Emotions, and was also a 2014 BBC New Generation Thinker. Before choosing to pursue a path in academic research and writing, Dr. Watt Smith worked as a theater director for seven years, including stints as Associate director at the Arcola Theatre and International Associate Director at the Royal Court. She lives in London.